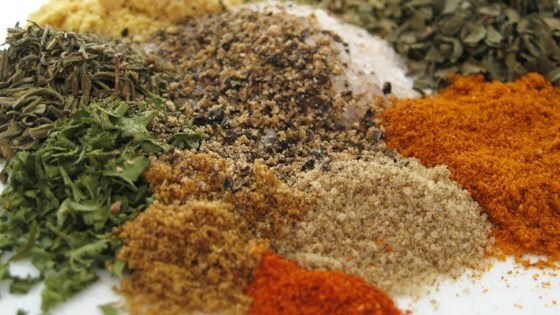 "This dry mix of herbs and spices adds a unique zing to any chicken dish, it has just the right amount of heat and flavor to make all your guests beg for more. Don't be scared by the long list, most of it is spices you will probably have in your cupboard. Note, it also gives chili a great flavor without adding too much heat." Mix the salt, basil, rosemary, garlic powder, mustard, paprika, black pepper, thyme, celery seed, parsley, cumin, cayenne pepper, and chicken bouillon together until blended. This spice rub has a lovely flavour, but even with 1/3 the salt is way too salty on baked chicken breast! Cut the salt to 1/4 tsp and it would be perfect! AWESOME!! I had everything except the Celery Seed, but substituted Celery Salt and left out the Sea Salt.